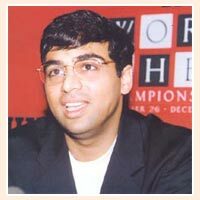 Viswanathan Anand is the current World Chess Champion and an Indian chess grandmaster. He was born on December 11, 1969. He is among the four players who broke the 2800 mark of the FIDE rating list. In 1983, at the age of 15, he won the National Sub-Junior Chess Championship. Later, in 1988, he became the first Indian Grandmaster, at the age of 18. He was the first youngest Indian to win the International Master title. Anand became the first Indian to win the FIDE World Chess Championship in 2000. Besides, he has won several other prestigious chess tournaments such as Linares, Corus and Dortmund. In 2003, he won the inaugural edition of the FIDE World Rapid Chess Championship.